England young guns finally turn up against a big side as they came from two goals down against Germany to win the game by 3-2. Harry Kane, Jamie Vardy and Eric Dier scored three second half goals to turn things around for England as Germany left shell shocked in what was a devastating performance by Roy Hodgson men. Watch full match highlights here. 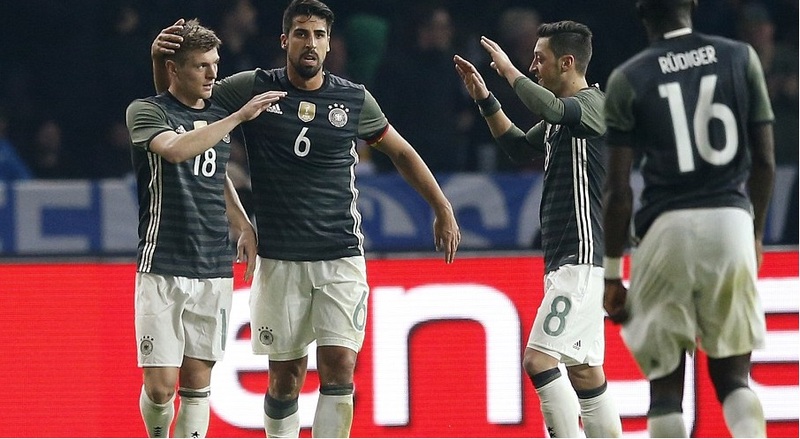 Toni Kroos had put Germany 1-0 up at the stroke of halftime and they scored again after the break when Mario Gomez made it 2-0 and World Champions looked like on their way to win against a very young England side. But there is something about this England team which shows they not only have talent but they can really execute when it matters. England went onto win the game in 90th minute with Kane, Vardy and Dier on target. 43′ 1 – 0 Toni Kroos put Germany in lead with a superb left foot strike from edge of the box. 57′ 2 – 0 Mario Gomez showed he still got it with a poachers header from close range. 61′ 2 – 1 Harry Kane turned superbly in crowded German box and unleased a classic low drive at the far post. 74′ 2 – 2 Jamie Vardy (is having a party) what a fairytale, Vardy poked home with a neat flick finish at near post. 90′ 2 – 3 Eric Dier won the game for England with a thumping header in 90th minute. In form Tottenham striker Harry Kane scored first for England in 61st minute and Leicester City striker Jamier Vardy Scored in 74th minute to equalize. which set up a thrilling finish to the game. Tottenham midfielder Eric dier scored in 90th minute to win the game for England and this might be a turning point for this young English team who will get loads of self belief heading into the Euro 2016. With this win there are massive question marks over Wayne Rooney’s inclusion into the starting lineup with Euro 2016 coming up. Germans were booed off the pitch after losing the game. German coach Low started with pretty much a full strength side and they had control of the game for best part of first 60 minutes but as soon as Vardy came on German defense was stretched and they failed to contain a very hungry English side.